Our objective is to eliminate poverty by creating jobs. We do this through our unique holistic approach that tackles the areas that matter the most to poor communities – microfinance, education, health, information, and environment. 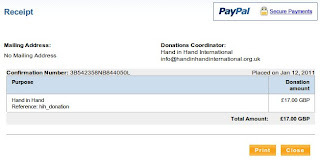 The amount donated is £17.00 GBP ($26 USD). It's not much, but according to Hand in Hand it will at least "Provide one woman with entrepreneurial training to start her own business".